Mission: "To develop trails and protect our greenways while enhancing the quality of life by providing healthy outdoor recreation and economic opportunities linking and strengthening our communities." Jefferson County, Ohio, is steeped in history and tradition. Residents and non-residents alike have identified the unique natural and cultural features of the area as having potential to establish and develop recreational tourism. With proximity to the states of West Virginia and Pennsylvania linked by the Ohio River, the area stands to benefit from populations that seek additional recreational opportunities. 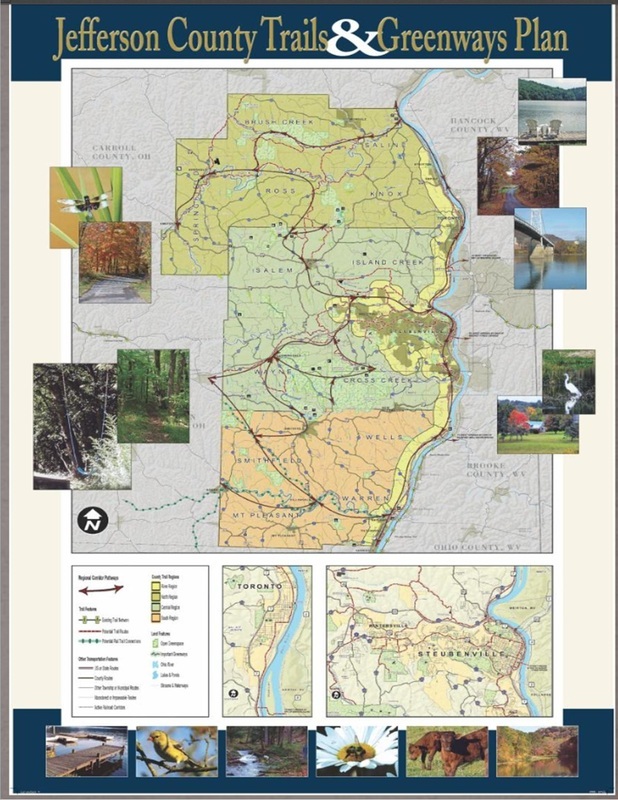 With inspiration, encouragement, and input from individuals and communities, a committee of interested local leaders have developed the Jefferson County Trails & Greenways Plan. This plan is a community vision for developing recreational opportunities, protecting open space, and preserving the historical resources of our beautiful and diverse county. In Jefferson County, there are many opportunities worth exploring to realize trail potential. Rural areas could use utility corridors while cities and villages may choose to designate alleyways as pedestrian walkways or bikeways. Other options include altering wide streets to include separate bike lanes, converting under-used rail corridors for use as rails-with-trails, or using floodplain areas along streams with relatively gentle grades at the same time conserving valuable green space. Other opportunities include connecting this vision to the many trail and greenway opportunities found in neighboring counties and states creating a regional network. Contact community officials, agencies, organizations, and user groups. Talk to neighbors about the benefits to businesses that could see economc development, to schools and Points of Interest that might be connected. Attend community meetings, help on clean ups and other special events. Contribute ideas - look for opportunities to make the vision a reality. Below is a PDF providing an in-depth look into the plan. You can also call our office at (740) 264-9790 for more information!